SELL YOUR GOLD, VINTAGE AND SILVER JEWELRY! The Best Place to Sell Your Gold! Top Prices Paid! Lane Mitchell Jewelers is a locally owned and operated business out of Colorado Springs and Manitou Springs. 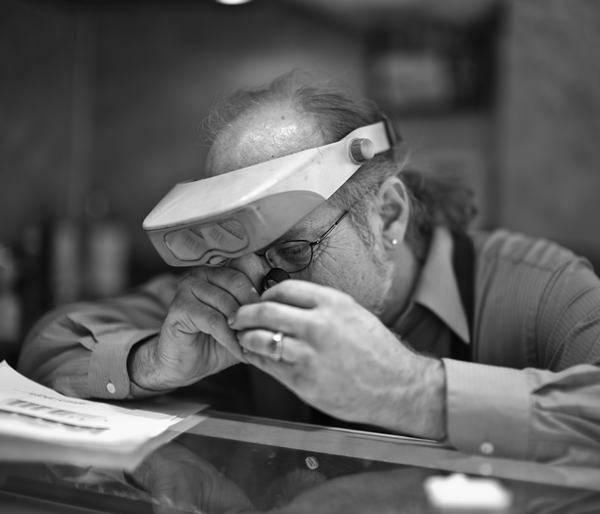 Our owner and Master Jeweler has over 40 years in the jewelry business. Honesty, integrity and exceptional customer service are our core principles. One of the first things we look at is quality and size of the diamonds and/or gemstones - if the diamonds or gemstones are low quality they may be harder to sell. This means that a jeweler or pawn may not be interested in purchasing them, as they won't be able to resell them or reuse them in making another piece of jewelry. This is especially true of jewelers who pride themselves on selling high quality jewelry. Another important factor from the buyers perspective is, "Is it desirable for resale?" If not, you are best to move on to the next store with a different market that may be a better fit for what you are selling. For example, Marquise and Pear-cut diamonds, as well as Pearls, can be considered "out of style", so you may not get as much money for them. The expectation of what you would like to get for your jewelry should not be based on the price you paid, but rather wholesale cost. For example: If you paid $4000 at a mall store, it could mean that they only paid $900 for the piece new at wholesale from a manufacturer. So the price you will get will be less that $900, because "you'll never recover the retail market-up that you paid." At Lane Mitchell Jewelers we buy gold, silver, platinum jewelry and gem stones. We also pay more than other jewelers. Our most desired items to purchase are vintage pieces and engagement rings with a high quality center stone. So, if you inherited your great aunts ring but don't know what to do with it, bring it to us, we will restore it for you or purchase it and find it a new loving home.​ If you do have three or more pieces to sell, give us a call to set up an appointment. The remaining of the materials is metals that are used in making jewelry to enhance strength and color. If an item was ever lost or stolen the amount of the appraisal is what you would expect to receive back from the insurance company for a new piece at a retail store. It is, however, not the price that you will be paid when you sell your piece of jewelry either to a local jeweler, like Lane Mitchell Jewelers, or at a Pawn Shop. How do you decide how much you are going to pay for a piece? Many gold and silver buyers melt down everything, we try to restore jewelry and find it a new home with someone who loves the piece. So marketability plays into the price (ie... white gold is easier to resell then yellow gold, round diamonds sell better than marquise cut). A white gold round diamond ring will bring more than a yellow gold ring with a marquise cut diamond. Additionally, high quality diamonds will bring more than commercial quality diamonds. When you bring your piece in to get a quote, we can talk to you about all the factors that go into determining the price we can offer you. We also encourage you to shop it around so you can get the best price! Many times, people come back to us because we were able to offer more than anyone else. If I have any paperwork, should I bring it with me? Yes, you should bring any paperwork that you have, however, some paperwork is more valuable. Diamond certifications from GIA, AGS, or EGL are the best. If you are selling a watch, original box and papers are important if it is a high end watch, like a Rolex, Breitling, Omega, etc.. An appraisal helps us know the color and clarity of the piece, but an appraisal done for "retail replacement cost" is not what you can expect to get when you sell it! Appraisals, what they do not tell you! When you get a piece appraised, it is done at retail replacement cost for insurance purposes, NOT the price you will get if you sell it. The price you can get when you sell it is closer to "wholesale" cost, not retail price. If you are going to try to sell your jewelry, do NOT pay for an appraisal, which can cost $100 or more, as you will NOT recoup the cost of the appraisal. We always ask people why they want a written appraisal, so they do not waste their money if they are not going to insure it. We will give you a FREE verbal quote on what we would buy it for, and what you could get if you sell it to a friend or neighbor, or on Craigslist. Depending how busy we are and how many pieces you have, you could be in and out in 15 minutes. You have to bring along a valid drivers license or state issued ID with photo. You will also be required to sign a police report that states it is wholly owned by you. If you have more than three pieces, we ask that you set up an appointment. When having three pieces or more your appointment can take up to 45 minutes. My Diamond is still in the setting. Is that okay? Yes, absolutely! We prefer to buy jewelry that is in tact. We will also buy mountings whose stones were removed, or will remove stones for you if you want to keep the stones. We will also buy broken rings and chains, but will only pay "melt price" if we can not resell them without extensive repair work. Do you buy Colored Diamonds? Yes, however, most color diamonds are heat treated or irradiated, so they are not as valuable as high quality untreated diamonds. NATURAL colored diamonds are rare, and must have a certification to be valuable. Do you buy other semi-precious gemstones? Yes, although the price you will get is based on supply and demand. We have an abundance of loose gemstones, and are not really in the market for semi-precious stones. However, high quality rubies, emeralds and sapphires (precious gems) will bring more money. The best diamond certification in the industry are AGS and GIA. This increases the price you will get on the secondary market if you have an AGS or GIA certification for your diamond or gemstone. Others, although not as valuable when you sell, are EGL, IGI, AGI, and others. We purchase high end watches, such as Rolex, Breitling, Cartier, Omega,Tag, Movado, Wenger, and older high end pocket watches in good condition. We do not buy Timex, Seiko, or other everyday watches. Original Box, Papers, and extra links with get your more money. Many older vintage watches need a lot of work, and do not sell on the secondary market. Some watch makers may need older watches for parts. Bring them in to and we can recommend the best thing to do with your grandmas old watch or your grandpa's pocket watch. How do I know if my flatware is solid sterling silver or if it is silver plated? When a piece of flatware says “STERLING”, “STER” or “925”, you can be assured that it is STERLING silver. Pieces marked “Silver” are NOT sterling silver. The mark “Silver” designates that it is a base metal with very thin silver plating. We only buy STERLING silver, we do NOT buy silver plated flatware. Lane Mitchell Jewelers is a locally owned and operated business out of Colorado Springs and Manitou Springs. Our owner and Master Jeweler has over 40 years in the jewelry business. Honesty and integrity are our core principles.